Installing Charitable Stripe Connect is the same as installing any other Charitable extension. If you’re not sure how to do that, we recommend first reading our guide to installing Charitable extensions. You will also need to install and activate Charitable Stripe, if it is not already activated. The first step before you can start using Stripe Connect is to enable it in your Stripe account. Log into your Stripe dashboard. Click on your profile email in the top right corner and then click on “Account Settings”. You may be prompted to re-authenticate with your password. Next, click on the “Connect” tab. Click on “Register your platform” in the bottom left corner. Follow the prompts to set up your platform. Configure your platform settings in Stripe. It is important that the Redirect URIs for your Development and Production settings correspond to the homepage url of your website. The URL must be exactly the same as the value you have for the “Site Address (URL)” in WordPress (Settings > General). Keep your Connect settings open while you move onto the next part of the setup process; you will need your client_id values soon. Now that you have registered your platform with Stripe, open a new window/tab and log into your WordPress dashboard. First of all, we are going to create a new page that users will be redirected to if they try to connect their Stripe account but fail (or cancel). We want our content to be dynamically generated based on the response we get from Stripe. To achieve that, we can use the following shortcode: [charitable_stripe_connect_response] (see below for more details about this shortcode). Next, you need to decide where users will be redirected to if they successfully connect their Stripe account. You can use the page you just created, since it will show a success message after connection; however, you may wish to use a separate page. If you do use a separate page, you can use the same [charitable_stripe_connect_response] shortcode in the content to display the success message. The Development Client ID and Production Client ID can both be found in your Stripe dashboard in the platform settings you were on previously. Copy and paste these across to your Charitable settings. The Development Client ID will be used as long as Test Mode is enabled in your Charitable settings. The Platform Fee is a percentage fee that your platform charges. You can set this to 0 to charge no fee. Directly on the connected account: The connected account is responsible for the fees, refunds, and chargebacks. The payment itself will appear as a charge in the connected account. Through your platform account: Provides much more customizability but makes the platform account responsible for the fees, refunds, and chargebacks. The payment appears as a charge in the platform account, along with a transfer from the platform account to the connected account. Please refer to the Stripe documentation to understand how this impacts you. Finally, for the Connection Success Page and Connection Failure Page options, select the two pages you created earlier and save your changes. The next step is to enable Stripe Connect as a method for sending money to your campaign creators. Go to Charitable > Settings > Ambassadors. If it isn’t already enabled, check the box to allow Ambassadors to raise money for “Personal Causes”. Then change the “How Will You Send Money to Ambassadors” setting to Stripe Connect and save your changes. With this set up, campaign creators will be automatically redirected to Stripe after they submit a campaign for the first time, so that they can connect their account. When you edit a campaign via the WordPress dashboard, you can check whether the campaign creator has connected their Stripe account by opening the Funds Recipient tab. When they have connected their account, this will display their Access Token and Stripe User ID. Note: It is important to remember that if the campaign creator has not connected their Stripe account, they will not receive donations towards their campaign automatically. error_header: The header displayed before the error message when the connection failed or was cancelled. Default: “Something went wrong with connecting your Stripe account”. show_retry_link: Whether to display a link to try again after a failed connection. This allows the user to return to Stripe and try again straight away. button_text: The text to display in the link/button to Stripe. Default: “Connect Now”. button_class: The class to apply to the link/button. Empty by default. 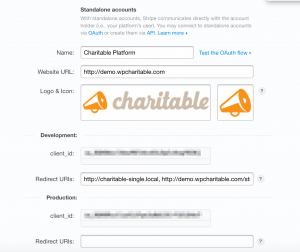 In addition to the two shortcodes above, Charitable Stripe Connect automatically adds a new field to the [charitable_profile] shortcode that displays whether the user has connected their Stripe account.